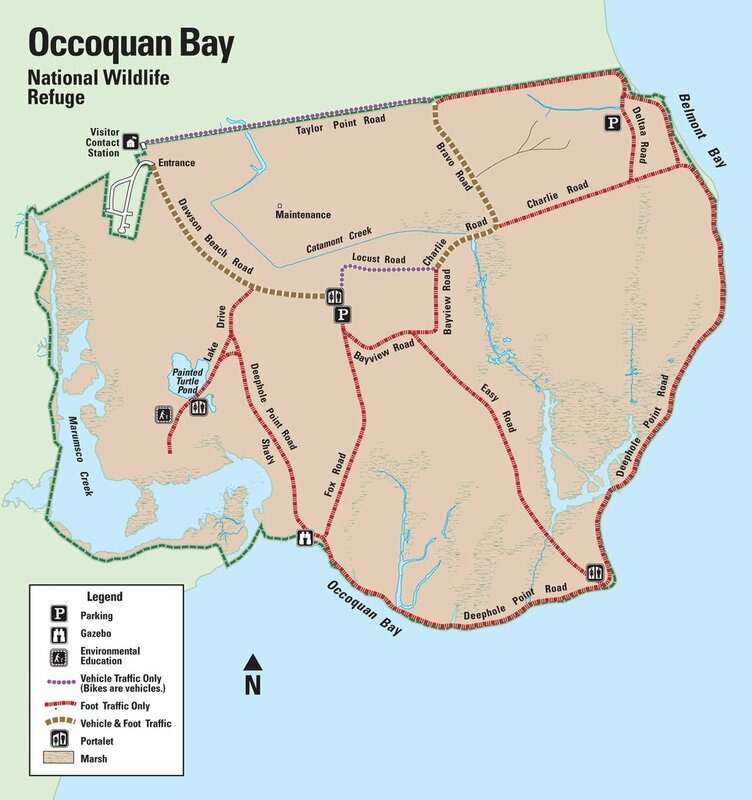 Occoquan Bay National Wildlife Refuge sits on the Potomac River, a major tributary to the Chesapeake Bay. The refuge includes a one-mile wildlife drive and over three miles of hiking trails along grasslands, tidal marshes and the river's edge. Over 650 species of plants and 200 species of birds have been observed at the refuge, which is one of the largest open areas remaining in northern Virginia. Occoquan Bay National Wildlife Refuge's diverse grasslands and marshes attract songbirds, raptors, waterfowl and butterflies that depend on meadows and open water for their food, nesting sites, and a place to rest. Visitors share this feeling of respite as they hike trails and watch wildlife drawn to the one-square mile refuge, a sanctuary in an urban setting. Daily Passes cost $2.00 per private vehicle, $1.00 if by foot or bicycle (children 15 and under admitted free), $20.00 for a commercial bus or van containing less than 20 people, $30.00 for a commercial bus or van containing more than 20 people. Annual and Lifetime passes are also available. Hunting: Occoquan Bay National Wildlife Refuge hosts two white-tailed deer hunt programs to manage the deer population. Wildlife Viewing: A network of roads from the site’s military days forms the basis for trails and a wildlife drive. Approximately 4 miles of gravel roads are reserved for foot traffic only. Snow shoes and cross-country skis are allowed on these roads during snow events. The refuge also offers a 2-mile loop serving as a one way auto tour route. Interpretation: Pay a visit to refuge volunteers at the Visitor Contact Station, open weekends, to learn about the local wildlife, habitat, and upcoming events or programs. Use our interpretative kiosks and information booths to choose a refuge trail or route to explore. Environmental Education: The refuge features several environmental education sites including two outdoor pavilions, a 2.7 acre pond with a dock and ramp, and a floating boardwalk in a freshwater marsh. Photography: Search for grassland dwelling songbirds along our hiking trails in the spring and summer or walk Deephole point road to catch a glimpse of waterfowl floating in rafts along the Potomac River. Visit the refuge’s photo blind situated on Marumsco Creek or the observation platform at the intersection of Fox and Deephole Point Roads. A Visitor Contact Station is open on weekends.